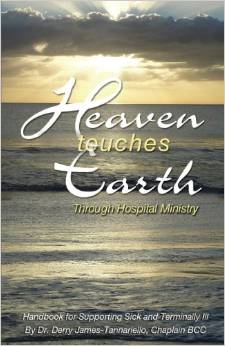 When I first read Heaven Touches Earth by Dr. Derry James-Tannariello, I thought that this is a marvelous resource for anyone involved in ministering and supporting the sick and terminally ill… I was wrong. This book is a wonderful resource for all of us. I dare say that there isn’t anyone out there that hasn’t had that all too awkward hospital visit to a friend or relative that has learned that they have a terminal illness. We don’t know what to say. We don’t know how to respond. I can tell you from first hand knowledge that the patient and the immediate family so very much need to have friends and relatives around. They need the support. But when we are just so uncomfortable with what to say to them, we stay away. This book cuts through all that. Yes, of course it is a handbook designed for those involved in hospital ministry – it certainly includes a great list of etiquette, hospital protocol, pastoral tools and how to minister to various populations… the how-to’s and where-to’s as it were. And I especially enjoyed the resources at the end of the book of the Healing and Deliverance Scriptures… that is a splendid addition. But this book is a great resource to help us to overcome our uncomfortable and to be ready to step into that friend’s room – young or old – and know how and what to say and what not to say. I think this is a marvelous book and I’m so please to have been able to read it. Thank you Pastor Derry. Disclosure: I received this book free from the Author. The opinions I have expressed are my own, and I was not required to write a positive review. I am disclosing this in accordance with the Federal Trade Commission’s 16 CFR, Part 255 http://www.access.gpo.gov/nara/cfr/waisidx_03/16cfr255_03.html.